Starting from September 30 the Russian Aerospace Forces have hit almost 800 targets in Syria. Syrian officers have noted improved combat morale among their soldiers because of Russia’s military aid. Government troops have initiated land operations in the provinces of Homs and Hama and are fighting in the eastern suburbs of Damascus. The Syrian army’s offensive is proceeding briskly, and the Pentagon has admitted that it is becoming increasingly difficult for Assad’s opponents to defend the towns they have captured. The militants are running low on weapons, the foreign mercenaries are fleeing, and the local supporters of the jihadists are opting to just melt back into the crowd. It is becoming increasingly difficult for the White House to disregard signs of change in the balance of power in Syria. President Obama’s administration does not have much of a choice – they must either begin to work with Russia or else openly side with the Islamist militants. But the Americans have one more idea up their sleeves, which would be to refrain from interfering in the events in northern Syria in exchange for support for a plan to partition the country into several zones controlled by Assad’s opponents. This would mean designating special enclaves where specific Syrian religious and ethnic groups would live. US policies are designed to pit «Shia against Sunni» in a ridiculously simplistic way, although the Sunni Arabs in Syria are fighting one another just as fiercely as against the government forces, where there are many Sunnis among the officer corps who are loyal to Assad. According to the UN, before the civil war in 2011, Syria had a population of 20.8 million, divided into 33 ethnic groups. Arabs make up the vast majority, but even they can be broken down into several different nationalities: Syrian Arabs (more than 14 million), Arab Bedouins from Najd (1.59 million), Palestinian Arabs (0.59 million), Lebanese Arabs (0.13 million), and also other diaspora Arabs (such as Arabs from northern Iraq, Jordan, and Levantine Bedouins). Despite Syria’s long history of affinity with the Islamic regime in Iran, it has nevertheless remained one of the most secular states in the Middle East. The «Shiite affinity» with Tehran has never been a factor in ideological arguments, much less played a predominant role. It could not have been otherwise, since almost 80% of Syrian society practices Sunni Islam. The Alawites and Druze, who also speak Arabic (a North Levantine dialect), make up a smaller percentage of the Syrian population, numbering about two million. But Syrian census data does not classify the Alawites as a separate group. The Assad dynasty’s national policy created a system that was generally fairly stable, although certainly not ideal, in which sectarian and religious differences were for the most part leveled out by the ideas of a larger national consciousness, in which citizens identify primarily as Syrians and only then as Arabs, Kurds, Alawites, or Druze. The Assad government still enjoys the support of a large percentage of the Sunni population. With its policies, the US is overlooking important aspects of the social fabric of the Syrian population and ignoring valid insights about who is against whom. Although Washington has had plenty of time to figure all this out, America has now spent five years expecting the imminent fall of Damascus. But they wait in vain. For the vast majority of Syrians, Assad represents a lesser evil than his political opponents who are so eager to replace him. And as for the terrorist groups – their base of social support in Syria is extremely small. For many years now the war against Damascus has been waged by thousands of foreigners, most of whom are common mercenaries. The Syrians have always considered the Islamic State (IS) militants from Iraq to be occupants, and 80% of the population has abandoned the regions under IS control. So who do the Americans think is going to be left to run this part of Syria that IS already includes within its «caliphate»? 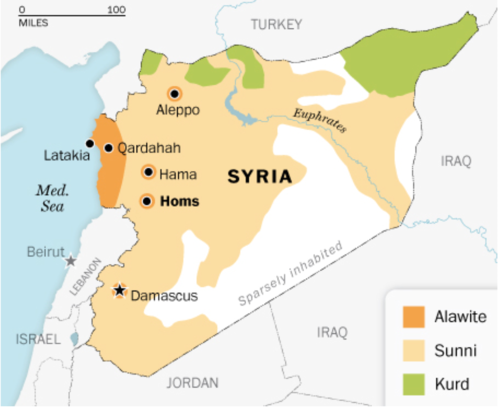 Syria’s Sunni Arabs have no interest in the enclaves proposed by the Americans. Nor are the Syrian Kurds – who account for at least 10% of all Syrian Sunnis – clamoring for this. Most Kurds live together in Kurdish districts, but they are not a majority even in northeastern Syria near the Turkish border, where they make up about 30-40% of the population. The Kurds have never had a simple relationship with the Syrian government. Damascus kept a tight rein on separatist tendencies among the local Kurds, not permitting them to develop close ties with other Kurds in neighboring states and restricting their political and civil rights. But the policy toward the Kurds changed during the civil war. The Assad government, which previously balked at issuing passports to many Kurds, has already offered Syrian citizenship to 2.5 million of them. Damascus withdrew its troops from the regions with a predominantly Kurdish population, trusting them to fight against the armed Islamists crossing over from Turkey, and Kurdish self-defense units were created for this purpose. Most towns in that region have fallen under Kurdish control. Now Damascus is no longer trying to thwart the Kurds’ separatist leanings, but instead sees them as potential allies. In exchange for their loyalty, Assad promised to accept autonomy for Syria’s Kurds, who have already announced the establishment of the Kobanî Canton in Syrian Kurdistan, although Damascus has not yet officially recognized that enclave. The Turkish government will continue its current efforts to do everything possible to prevent the Kurds from winning any degree of autonomy in Syria that is similar to what they possess in Iraqi Kurdistan. The US is unable to alter Turkey’s stance – Ankara would never support the American scheme to carve up Syria in a similar fashion. The US is now faced with a situation in which their actions are rankling almost every one of their allies who have in some way or another been drawn into the Syrian conflict. It is hard for Washington to simply assume that its policy will be understood, when that agenda does not address the question of who is really the Americans’ biggest enemy in Syria. Saudi Arabia and its Gulf partners are awaiting confirmation that the US will continue to fight against Assad, but not against radical Islamists. Turkey also opposes Assad, but wants to fight the Kurds instead of the armed terrorist gangs. Another US ally, Israel, does not object to the creation of a Kurdish state, but – keeping in mind Israel’s own security – believes that it would be more dangerous to replace Assad with IS kingpins in Damascus. Europeans are irritated by America’s befuddlement, which is prolonging the influx of Syrian refugees into Europe. It seems that American politicians are faced with a problem they can’t solve, because they have to please so many different allies with mutually exclusive demands. So the gambit intended to end the war in Syria by dividing the country into powerless enclaves is now looking like an American policy to definitively absolve itself of responsibility for this confused mess. Obama’s Middle East policy has played itself out. Washington has no constructive ideas about what to do in Syria.